When we heard what the Encinitas tree-sitter was doing, Patty and I wanted to meet him. So we drove up the coast on a beautiful day to do just that. 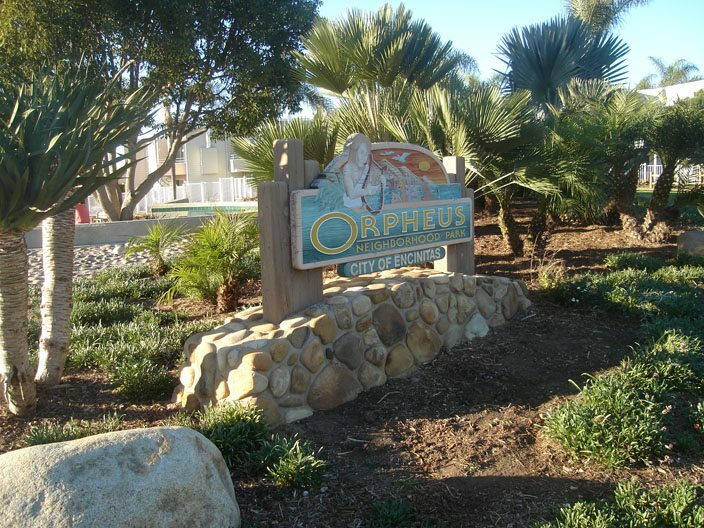 We found Orpheus Park – about halfway between the freeway and the coast – denuded of most of its trees. And there was Andrew Watkins hanging upside down from a large branch, along with a few other friends who had climbed up to the platform that Watkins had assembled. 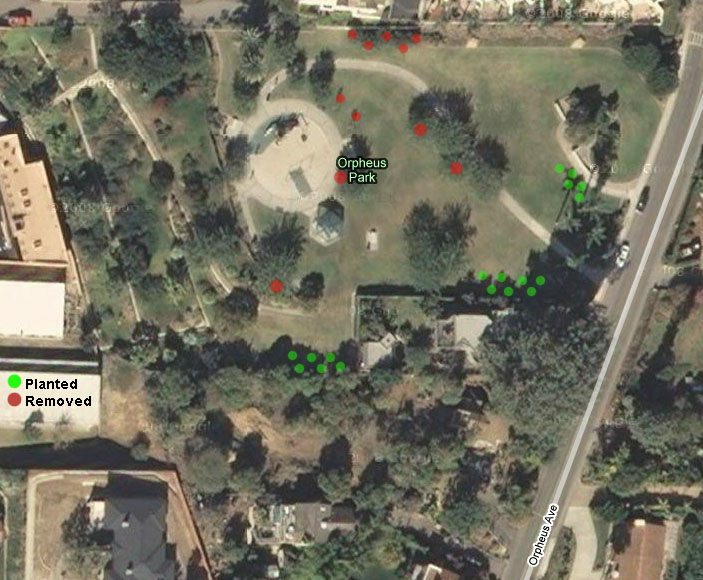 When word of what the City of Encinitas was going to do – chop down adult trees in a local park because of complaints of loss of views from nearby condo residents – Watkins pushed his wood platform up into one of the tipuana tipu – not a large tree – climbed up himself, and waited. That was Thursday night in the wee hours of January 29th. We read about him in Saturday’s Union-Tribune. There was a follow-up piece today. Andrew told us he was going to stay in the tree until the mayor came down to tell him it was not going to be cut down. He had heard about the OB Rag blog, and was very friendly. We told him we appreciated what he was doing. Andrew’s friends, other fellow tree lovers, school kids had come out to lend verbal support. Some had given him refreshments. Media had paid him several visits. He was certainly getting his 15 minutes of fame, and more. I snatched up this Google satellite image and marked the places where trees had been cut down and where new trees have been planted. Almost all the shade from the center of the park has been taken away and the new trees have been planted around the edges of the park. Never having stepped foot into this park before, it was difficult to see what damage had been done. Until we saw the mounds of dirt – sitting like tombs of the cut trees – scattered about the grassy park on a hill. Some had little signs stuck in the earth where once great, shady trees had stood. It was sad. But instead of sadness, Andrew Watkins was energized. He had crawled out onto a limb, literally and figuratively. In his view, the next move was by local government. Awesome photage, guys! Good job on the map of axed trees, I assume Patty did it. We all were saddened to learn of the stupid cutting down of the tree. We had visited it and had met the tree-sitter. Even though Andrew Watkins was vilified by the press just before the ax fell, it was Watkins who brought our attention to the tree and the plight of a park. Humanity proves how absurd modern life is.